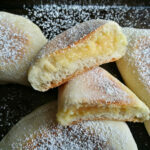 These Stovetop Custard Cream Buns make a great breakfast treat or snack. 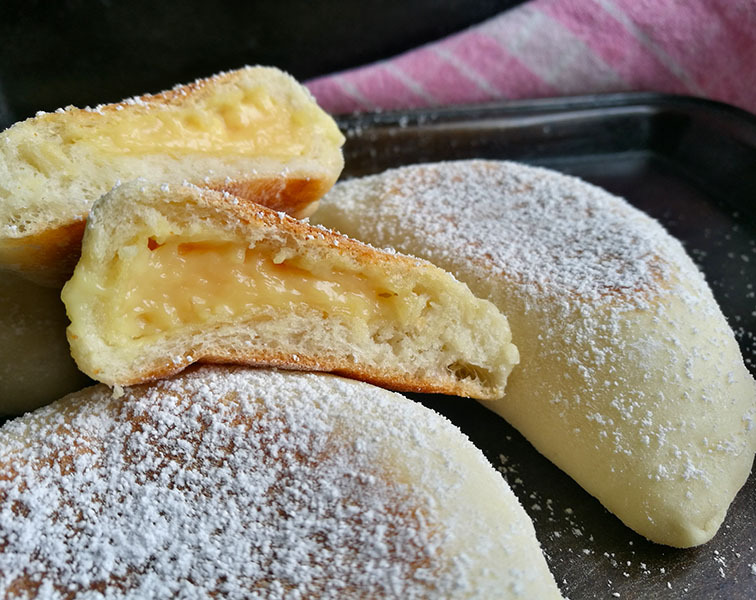 Sweet custard wrapped in a soft milk bun, easy to make and so delicious. I really love baking my own bread. From the kneading to the baking and the best part, the delicious smell and taste of homemade bread. It is like comfort baking and comfort food in one. Made using such basic ingredients to create an incredible flavour. Although these custard cream buns are not baked in the oven, cooking them on the stove top still fills your home with that aroma of homemade bread goodness. These buns are not overly sweet, making them such a great snack or lunch box treat. 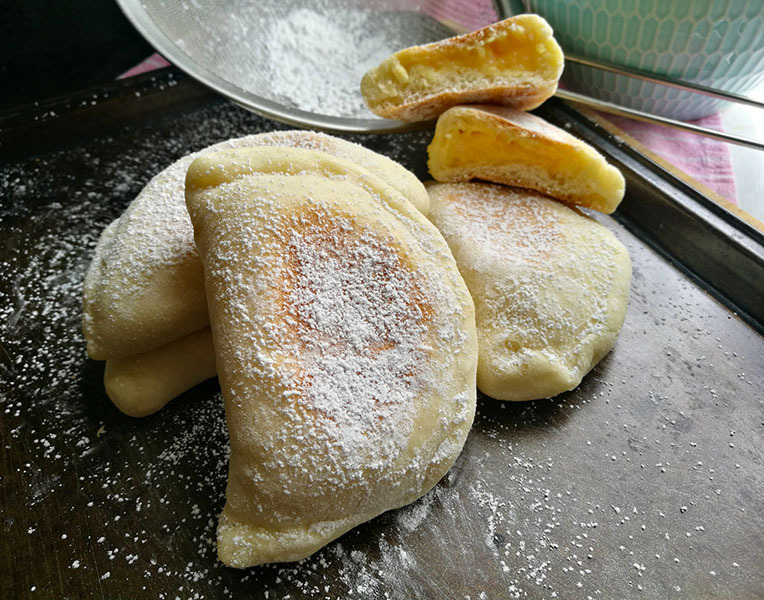 To make it a bit of a sweeter treat, however ( which I absolutely love) you can just sift a bit of powdered sugar/ icing sugar over the cooked buns. This is an egg-free recipe because the filling is made using custard powder. If you prefer to make your own custard, then go ahead and use it in place of this filling. 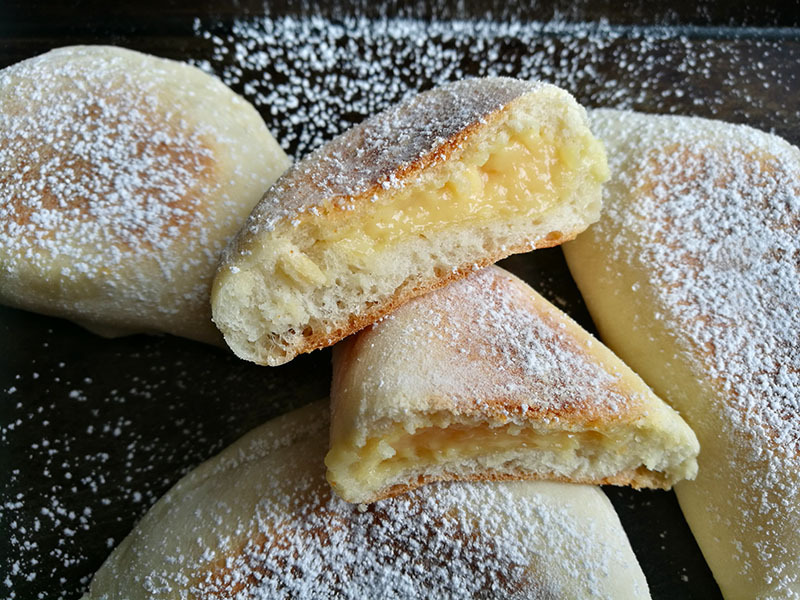 A deliciously amazing recipe, these stovetop custard cream buns are so easy to make. Start by making the dough. Using a large bowl, combine the instant dry yeast, sugar, salt and flour. Mix together the warm water, milk and oil in a saucepan or measuring jug and add it to the flour mixture. Knead for 5 minutes, until it forms a smooth, soft dough. Cover and leave to rise for an hour in a warm, draft-free area of your kitchen. Using a whisk, mix together the dry custard powder, sugar and milk, in a saucepan until smooth and free of lumps. Place this mixture on the stove on medium heat, for 2 minutes and mix until thickened and smooth. Allow to cool completely. After the dough has risen, punch it down and knead for 3 minutes. Divide the dough into 12 equal pieces. roll out each piece into a circle. Place a teaspoon of the cooled custard on half of the circle and fold the other half over to cover. Press and seal the edges well and leave to rest for 15 minutes. Heat a non-stick pan on low heat. If you do not have a non-stick pan, then just cut baking paper/ parchment paper to fit the shape of your pan. Brush with a little oil and gently place the custard cream buns into the pan. Cook on low heat for 10 minutes then flip it over and cook the other side for 5 minutes. When cooked remove from the pan, and allow to cool for a few minutes before serving. Dust with powdered sugar/ icing sugar if preferred. Using a large bowl, combine the instant dry yeast, sugar, salt and flour. FILLING AND COOKING THE CUSTARD CREAM BUNS. After the dough has risen, punch it down and knead for 3 minutes. Divide the dough into 12 equal pieces. roll out each piece into a circle. Place a teaspoon of the cooled custard on half of the circle and fold the other half over to cover. Press and seal the edges well and leave to rest for 15 minutes. Oh these look just amazing yummy Ashika! That custard filling looks so creamy. I would have never thought you could make something like this on the stovetop!! Hi Gugu, there is a print button on the recipe card, this will make a copy of the recipe for you. Wow Ashika, this is genius! I love how simple these are and how you used cooled custard in the middle of them. I love cold custard more that I like hot custard (strange I know) so its going to be difficult for me to stop eating all that custard before it goes in as the filling!! These look so decadent Ashika! What a perfect treat for breakfast. And that filling is really calling my name! I’d love to get my hands on a few of these. That custard filling!! Delicious. I love baking bread too. It’s so therapeutic! And then you get to eat fresh bread so it’s hard to go wrong :). These little buns sound just delicious! I’ve vowed to make more breads this year, and this recipe looks like it will fit right in. I never ever thought of cooking soething like this stovetop – what a great idea! Thanks for the inspiration Ashika!